It’s on Sunday and it’s in the World Tour so on paper this is a big race although the course probably isn’t as selective as the freshly finished E3 Harelbeke. Cobbles and climbs feature but so does a long section to the finish line making this the most sprinter-friendly of all the major cobbled classics. The Route: Gent-Wevelgem does not start in Gent, an outrageous lie. Instead Deinze, a town of about 30,000 people and some 25km away from Gent is where it starts. No longer does Gent-Wevelgem go to the sea. For years it headed west and rode along the coast but now it stays inland. The coast is exposed and could often split the bunch, the inland route is hardly sheltered but it is a touch easier. The second half of the route sees a series of cobbled climbs starting with the Casselberg or Mont Cassel as the locals call it. Mont Cassel: the course is about the second half when the race crosses into France for the first climb of Mont Cassel which is tackled twice. It’s longer and higher than your typical berg and it’s urban and includes the Porte d’Aire archway. If it’s cobbled in part, it’s smooth and sections of pavé have had asphalt poured on top to level things out. It’s not decisive but it’s hard and saps the legs with a section at 19%. The Kemmelberg: once the site of slaughter in the First World War, the Kemmel now welcomes all to ride up its cobbled road. It has been used in this race since 1955 when it was wholly unpaved. Now a mix of tarmac and cobbles, there are several routes up and down and recent editions have seen the race take a more sensible descent after the cobbles provoked bouncing water bottles, bikes and even riders to fell others. The Finish: fast and flat and on a wide road. The Scenario: often a bunch sprint but from a reduced group meaning it’s not a grand tour style sprint finish but a select group where some sprinters can win thanks to their finishing speed. The lead group gets thinned by the climbs and crosswinds although this year’s edition promises calm weather, reducing the rate of selection and tilting the odds to a sizeable bunch sprint. The Contenders: Peter Sagan is the prime pick, he can beat the best in a bunch sprint but is willing to attack and ride from the front as we saw in Harelbeke… and Wevelgem last year when he rode away to win solo. Fresh from the win in the GP E3 Harelbeke he’s got nothing to lose and race knowing others might be feeling the pressure. As usual though his weakness is the team, if he’s caught out in a split then he’s got to react fast and do the work himself. 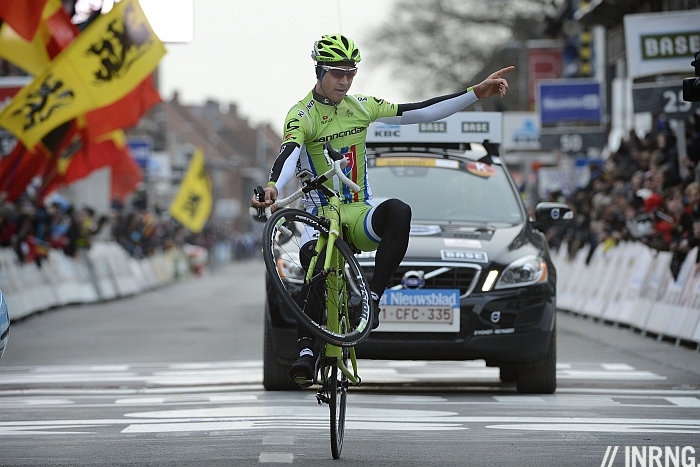 Tom Boonen is the second pick because whatever Sagan can do, Tommeke can too. Only there’s talk of a broken thumb so he’s a provisional pick. By contrast to Sagan Boonen normally has a big team in support yet this is also a hindrance too because a number of OPQS riders can win, we see their tactic of sending riders up the road is proving to be very effective. Only this time the squad comes with a relatively light roster. Mark Cavendish is ill meaning a sprint train without a sprinter, Matteo Trentin and Geert Steegmans. But it’s OPQS and Belgium so they come with Zdeněk Štybar but is it too flat? If this is OPQS’s weekend off then several teams will delight in their relative weakness. 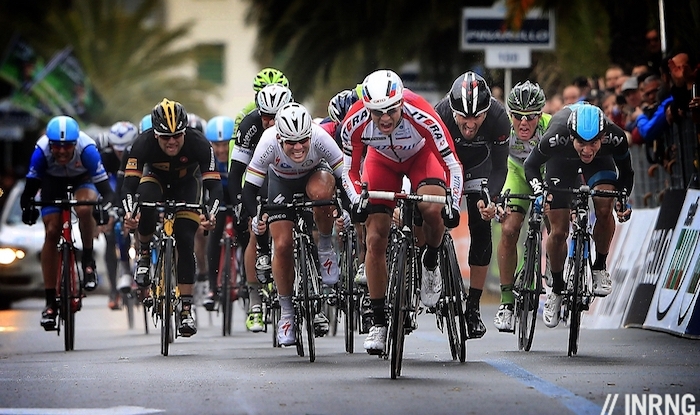 Alexander Kristoff racing and if he was my second pick for Milan-Sanremo hopefully he needs no introduction now. Katusha have a back-up sprint plan with Alexey Tsatevich. Three other teams come with a top sprinter. First is Giant-Shimano in support of John Degenkolb. He’s in top form but has been denied the chance to sprint, a puncture in Milan-Sanremo for example. FDJ line up in support of Arnaud Démare who is close to signing a deal to stay with the squad for the next four years. He’s got what it takes to win as he can do the climbs, has a good sprint and seems to rise to the occasion. Lotto-Belisol are another squad in support of a sprinter, this time André Greipel and the Belgian team need a win, this could be their best chance. Fabian Cancellara was all over the GP E3 Harelbeke. A crash saw him lose out on the front group but he was chasing so hard at times you wondered why he didn’t shut it down. His problem will be escaping, the terrain in this race just isn’t hard enough and will he really want to go on a 40km solo raid? Why not? Team Sky’s Edvald Boasson Hagen is often where he needs to be and if there’s a sprint he’s a contender. But I think the British team will prefer the Ronde. Belkin aren’t bringing Moreno Hofland and instead have Sep Vanmarcke who I think is better suited to next week’s Ronde van Vlaanderen. Meanwhile BMC have Taylor Phinney back but it could the chance to get behind Greg Van Avermaet. Two outsiders for the sprint are Tyler Farrar (Garmin-Sharp) and Borut Božič (Astana) as both are in form and at the front of the bunch; a win seems improbable but a podium possible. Behind these two there’s Movistar’s J-J Lobato, Lampre-Merdia’s Sacha Modolo. Meanwhile Orica bring Matt Goss, dropped for Milan-Sanremo so maybe Jens Keukelaire is their best bet. Other fast-finishers include Europcar’s Bryan Coquard, TopSport Vlaanderen’s Tom Van Asbroeck and NetApp-Endura’s Sam Bennet but if this is race for sprinters, it’s still 235km and with selective hills, only the best get to contest. Weather: warm and sunny with temperatures of 21°C and almost no breeze the weather shouldn’t be a factor unless some riders get cramp from the heat. The finish is expected for 4.55pm Euro time. Note the clocks change in Europe this weekend with Sunday’s on GMT+2. If you’re inclined, be ready to zap channels and windows as it’s also the finish of the Volta a Catalunya with its tricky Montjuic circuit while the Criterium International gets its decisive showdown on the Col de l’Ospedale. 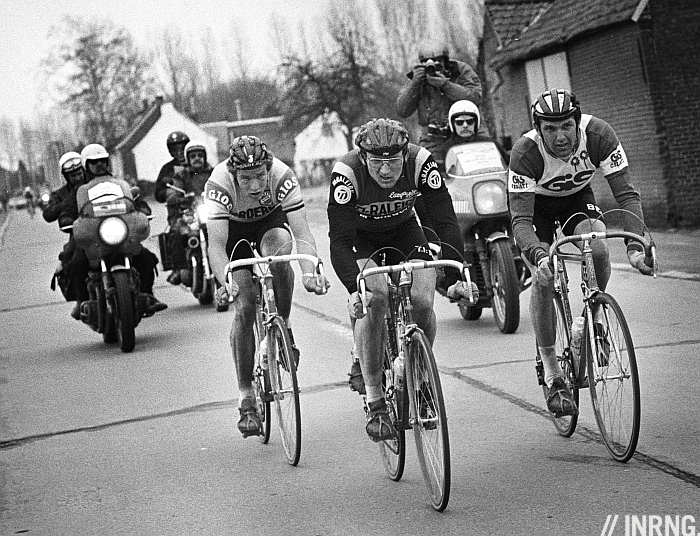 History: now held on the Sunday before the Ronde van Vlaanderen, Gent-Wevelgem has a prime spot on the calendar. It wasn’t always so as it was held on the Wednesday between De Ronde and Paris-Roubaix, a test effort for some and a Flemish reward for the sprinters. Five riders each have three wins including Tom Boonen who can get ahead of Eddy Merckx with another win. Future: there’s a women’s edition on, the third ever race. Haven’t seen any news re Boonen’s thumb. When did that happen? You’re right, he’s been off with a fever and this could be OPQS’s weekend off. Update: he’s not riding and replaced by Iljo Keisse. I’ll rework the piece above. I can’t see it on the British Eurosport schedules. We get Cape Rouleur 2014 instead! Apparently “riders also get the opportunity to gain seeded entry to the Cape Argus Pick n Pay Cycle Tour, the world’s largest individually timed cycle race followed by VIP hospitality.” As ever, Eurosport knows what cycling fans really want. and while you kicking their arse, tell them to get David Harmon back on the mic – we deserve it! So they changed the course a little this year, any idea why? I used to like those coastal shots of the peloton.. As for the race, I think Cancellara will be willing to try a demonstration after his tactical debacle in Harelbeke. I’d particularly like G-W to be won the way Cancellara wins. Chainring rating system, exciting development @INRNG! And they’re even the inner chainrings too! Great preview, one of the best! Most bases well covered there, IR – to mix metaphors of sport. Upon scanning the start list, I too was very surprised that Belkin have omitted to start young Hofland: GW would seem to be the perfect target for his burgeoning abilities – especially considering the relative strengths of their stated starting line-up. Vanmarcke’s looked very impressive so far but I don’t think he’s got that extra kick needed for a large bunch finale. So… If he makes the distance I quite fancy AG2R’s improving Appollonio to distract and distance the other main contenders. Hofland, too, is sick. That’s why he’s not starting. Can’t reply directly to Birillo and Spatz in the mobile version… but for once it’s not Eurosport’s fault. Flanders Classics have chosen sell the UK rights to their races to Sky. Get angry with Sky for only showing half an hour of highlights at midnight and turning the clock back to the 80s when Channel 4 used to show their half hour TdF show at equally insane hours. Thanks for clearing that up. I withdraw my sarcasm unreservedly. André Greipel for me with Tyler Farrar landing a surprise podium spot too! It’s easier to control this race than the Ronde or Paris-Roubaix, so the big favoruite has to be Sagan. But I root for Cancellara too!